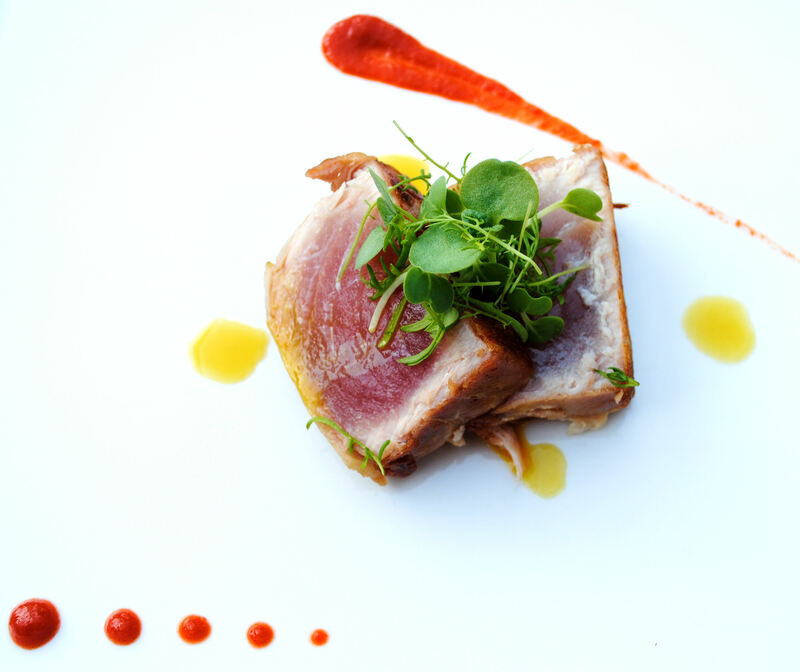 ‘Just For Food’ Blog: Flavour meets Beauty! Kosta Kontogiannis is the creator of the Just for Food Blog, which focuses on the wonderful world of fine dining! His passion and eye for colorful, flavorful, and distinctive cuisine make his blog quite interesting and fun to read. He’s not only a writer but a wonderful chef as well with many innovative ideas. Fresh Origins got the chance to meet him at the Star Chef’s Congress in NY last year and has since formed a very nice relationship with him. 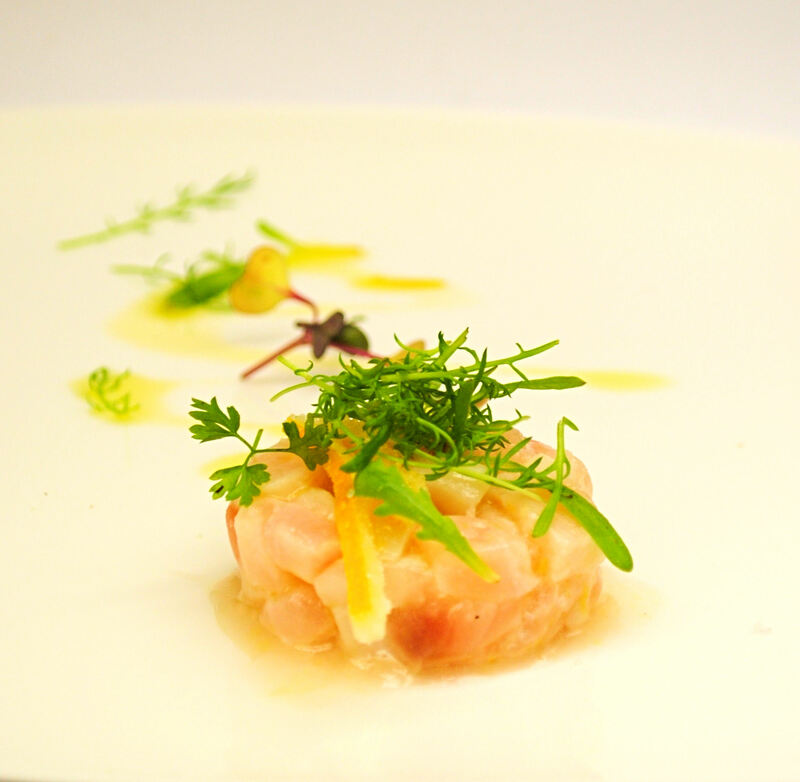 Here are some of his fantastic recipes using Fresh Origins MicroGreens! This attractive appetizer truly makes mouths water….. Dice the rockfish into very small pieces. Place in a shallow container. Mix in the citrus juices and the zest. Let sit for 35 minutes to an hour, covered, in the refrigerator. The lemon will effect the appearance and taste of the fish if it sits too long, so pay attention. Drain 3/4 of the juices allowing just a little to remain. Add olive oil to lightly coat and stir in the scallions. Season with salt and pepper. Reserve ceviche in the refrigerator. Use a vegetable peeler to remove the peel from the lemon in vertical strips. Try to remove only the yellow zest, avoiding as much of the white pith as possible. Save the lemon for another use. In a small saucepan, combine the peels with 2 cups of cold water. Bring to a boil, then drain out the water. Again add 2 cups cold water, bring to a boil, and drain. Repeat the process a third time, then remove the peels from the pan and set aside. Add 2 cups of sugar and 1 cup of water, whisking until the sugar dissolves. Add the peels and bring to a boil over medium heat. Reduce the heat to medium-low and simmer, uncovered, until the peels are tender and translucent, (max 10 minutes). Drain the peels and let cool. Add the remaining 1/2 cup sugar into a medium bowl and add the peels. Toss to coat. Using a fork, remove the peels one at time, gently shaking each to remove excess sugar. Store in an air-tight container. The peels will keep for several weeks. 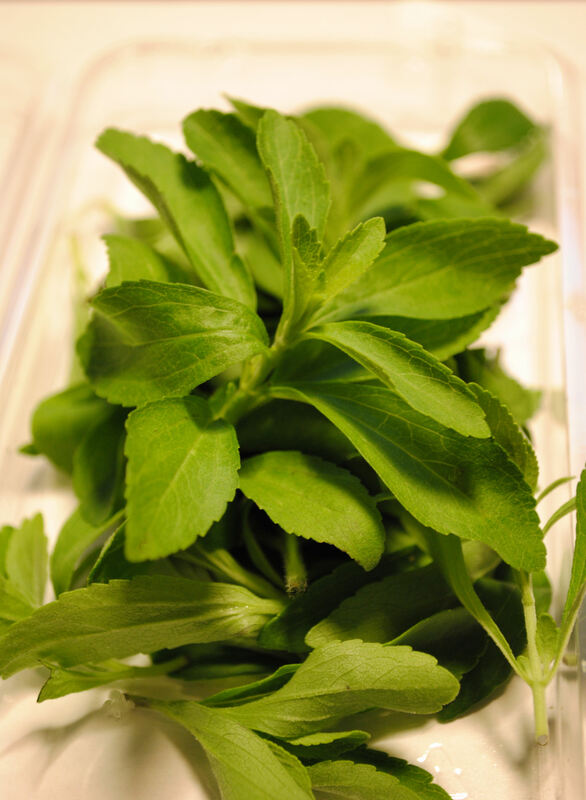 Toss Fresh Origins Micro Chamomile very lightly with a few drops of lemon juice and a tiny bit of olive oil to coat. 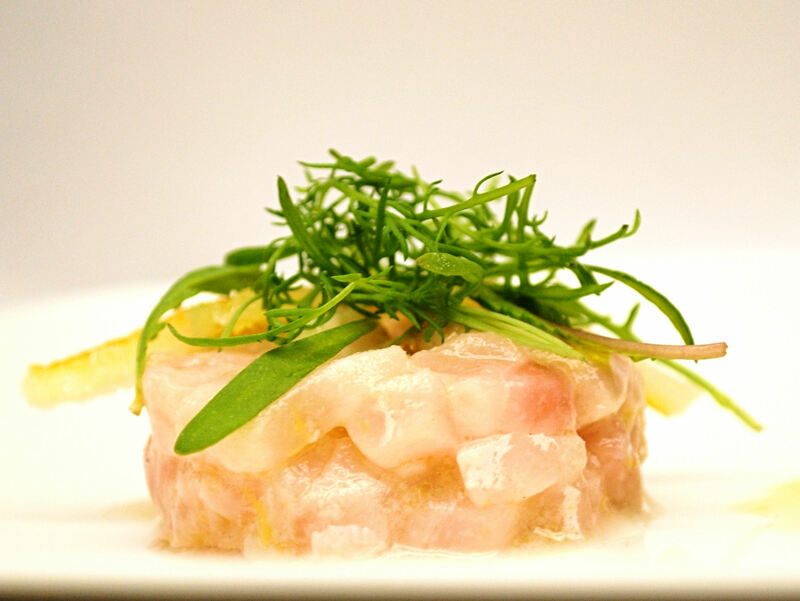 Using a mold ring, form the ceviche on a plate, then drizzle lightly with olive oil, a small pinch of Fleur de sel and one thin strip of the candied lemon rind. Place Fresh Origins Micro Chamomile on top. Serve cold. Next up, we have a delicious and beautiful seafood entreé…. Cut the tuna into large rectangles, season lightly all sides. Roll the tuna with prosciutto tightly. Set in refrigerator. Roast and peel yellow and red bell peppers. Blend yellow peppers until smooth with salt, white pepper and a few drops of simple syrup. Pass through fine sieve. Add 1/3 tsp of shiracha and blend well. Repeat with red peppers. Let sit for 1 hour before use. Heat a non stick pan and sear the prosciutto wrapped tuna for 2 min on each side with med to med high heat. Remove from heat and let rest for 2-3 min. Slice the tuna into small thin square slices. The tuna should be rare in the most parts. Toss Micro Chamomile and Micro Shiso Green with a few drops of yuzu juice and olive oil. Place Tuna on a plate. Using the Red pepper essence place a stripe of sauce close to the tuna, then add a few drops of the yellow pepper essence around it. Drizzle a few drops of yuzu on the tuna and a few drops of olive oil and some fleur de sel. Place MicroGreen salad on top. Last but certainly not least, this poultry recipe will wow your eyes and taste-buds…. “Lavender Tops have a bold flavor. They have a tea like essence at first in a liquid but seem to get stronger. It is very important to use them with moderation as they tend to give a bitter aftertaste to liquids. Place Muscat de beaums in small pot and heat without boiling. Remove from heat and add Fresh Origins Lavender Tops and gelatin sheets for a few minutes. Dissolve gelatin in Muscat and drain the mixture into a small plastic tray or mold of preference to create a “sheet” or a rectangle that will allow you to slice the gel. Set outside the refrigerator for about 30 minutes then cool in refrigerator until completely set. Cut small rounds out of the gel with round cutter or cutter of your preference. Set aside. Place balsamic and 2 peppercorns in low heat and cook until mixture is reduced by 1/3. Add the honey and reduce almost in half. Do not allow balsamic to have a syrup consistency yet, as it will become really thick when it cools down. Taste and adjust acid with a couple more drops of honey if necessary. Strain and allow to cool for at least 30 minutes. Setup immersion circulator water bath to 60.5 and allow to heat up. Vacuum seal duck breast in bag with 2 tbsp of duck fat, a sprig of thyme, a little salt and fresh ground pepper. Place in the water bath for 30 min or 45 min depending on size (300 or 400 grams). When you’re ready to take the bag out of the water bath, heat a cast iron skillet. Remove Duck breast from bag, score the skin in diamond pattern and quickly sear the skin side down first then sear lightly on the other side (remember the internal temp is rare to med rare already so do not over cook). Remove from heat and let sit for a couple of minutes. Slice into thin pieces and set aside. 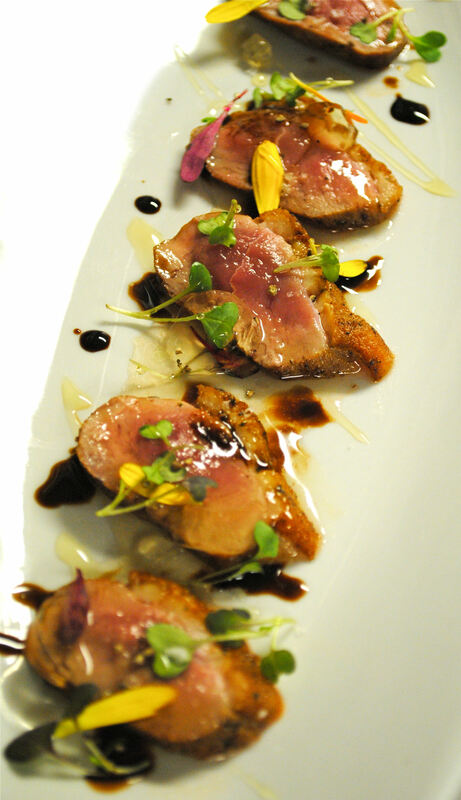 Place sliced meat on top of a streak of balsamic reduction. Garnish with Fresh Origins MicroGreens and the gel on top. Decorate with dots of wildflower honey and balsamic reduction. Clean and score the skin of the Duck breast in a diamond pattern. Sesaon with salt, ground pepper and fresh thyme. Let sit and come to room temperature (about 15-20 minutes). Sear in a pan (cast iron pan preferably) on both sides starting with skin side down first getting a good crust, then flip over and sear for a few more minutes. Probe with a thermometer to read 125 degrees F. Remove from heat and allow to rest for a couple of minutes. Slice thin and finish as described above. Getting thirsty? Well, you are in luck! Here are some of Kosta’s fabulous Cocktails! 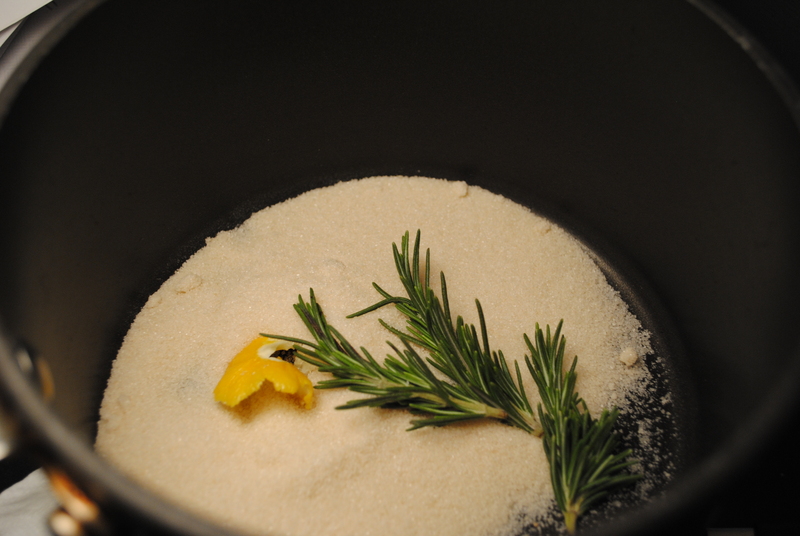 To make the base, make a syrup that has a 1:1 ratio of sugar to water, adding the rosemary and lemon zest. Bring to a boil, dissolving sugar while stirring. Remove from heat and let cool. Discard lemon zest and rosemary. Combine half of your syrup or less (judging by how sweet you want it to be), juice of 1/2 lemon, vodka and ice. Mix in shaker and strain and into a chilled martini glass. Garnish with Fresh Origins Rosemary Tops. Perfect for a hot summer day spent poolside…. 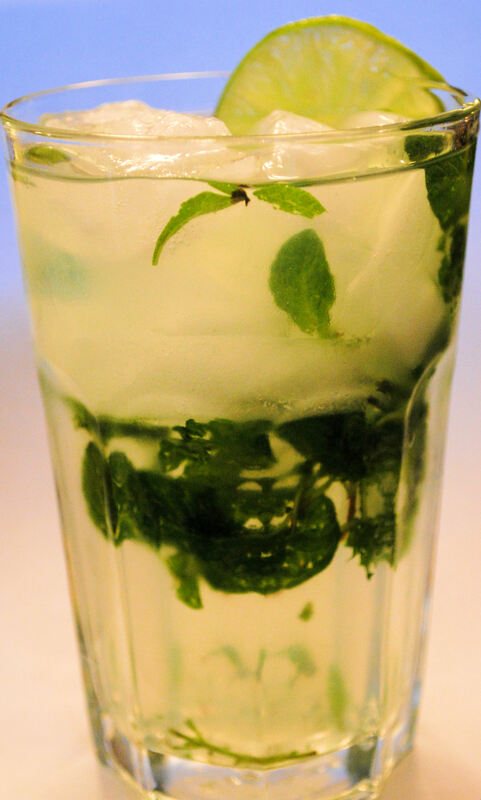 Now we transition from tangy to sweet…..
Place the Mint and Fresh Origins Petite Stevia™ in a glass and using a muddler “bruise” the herbs. Add fresh squeezed lime juice, rum, club soda, 1/2 tsp of stevia powder and ice. Stir and taste. If you want your drink with more kick, add 1/2 oz more rum. If you would like it sweeter add some stevia powder, 1/2 tsp at a time (it dissolves great). Thank you Kosta for all the great recipes!! Brightening the Holiday with What is New on the Farm!